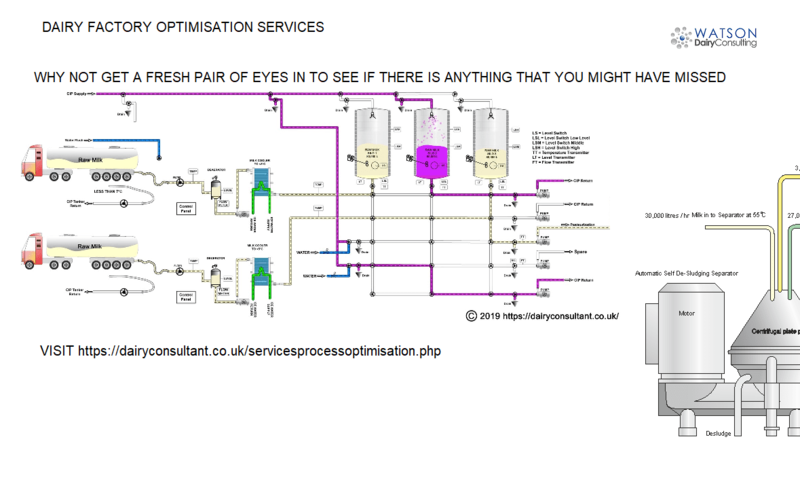 Watson Dairy Consulting offers Dairy manufacturers process review and optimisation services. We can help dairy companies with single or multiple manufacturing plants to improve their productivity and profitability by carrying out a review of plant engineering and processes to establish if the latest best practice is utilised to ensure maximum productivity, efficiecy and yield. Rapid scans have resulted in immediate results and annual savings exceeding £1m per annum on a single site. Why use an outside dairy consultant? It can make a significant difference to have an independent experienced dairy expert, external to the dairy business to confidentially review, evaluate and dairy manufacturer benchmark your operations, prioritising of areas for improvement based upon maximum immediate and long term benefit to the dairy business. We are very experienced dairy processing experts / manufacturing process evaluation engineers and can rapidly (1 day) identify areas for change with a view to implementing dairy benchmark best practice across the company. We rapidly identify inefficient dairy plant, procedures and processes and evaluate critical process equipment vulnerabilities and optimise dairy yield whilst minimising dairy waste and dairy efluent. We provide you with a report and recommendations and are confident in our ability to deliver savings. We can work closely with you and your team to assist in rapidly identifying the cost benefit prioritisation for change. We can work with your team to prepare and implement management reporting formats & Key Performance Indicators relevant to your product range and processes. Our extensive expertise within dairy manufacturing, quality systems, management, training and engineering makes us ideally placed to rapidly assess an existing business, factory or a new business acquisition and make recommendations on its optimum integration into the core business including the identification of strengths and weaknesses. We can assist in a variety of capacities ranging from business development to analysis and are happy to act as strategic business advisers for our dairy industry clients. We work closely with our clients to gain an in depth knowledge of their business with a view to establishing a long term working relationship to give them maximum benefit. We will assess staff, process and equipment utilisation to ensure that our clients have the right people and equipment in the right places. We can also help with the identification of prospects for internal promotion and with recruitment of appropriately qualified and experienced external staff. We can assist with identifying where necessary rationalisation benefits of roles and processes. We are one of the most experienced Dairy Consultancies operating globally. For more information or to discuss your requirements please contact us.